Whether you are searching for a standard size dining table or a long dining table with extensions, the Ruff Sawn Williamsburg Extendable Dining Table is a great match! Available in six different lengths and five different widths, this table is available in 30 different size combinations. Crafted from solid wormy maple wood, this table is made with rough sawn distressing for a rustic charm. Enjoy longer extensions by upgrading to two 22" breadboard end extensions instead of the standard 18" dining table extensions. 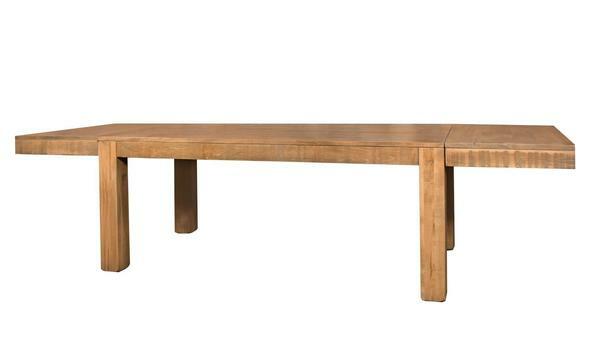 Proudly Made in America, this solid wood dining table is made to order. Call us today for questions and assistance in placing your Amish dining table order. We have a team of Furniture Specialists ready to help you order quality furniture that will be in your family for generations!